Hilary McGraw is the current Research Director for the American Museum of Women’s History Congressional Commission. Prior to working for the Commission, she was employed as a research associate with the existing virtual National Women’s History Museum, contributing to programming, as well as, conducting several crucial internal research projects. She has previously worked with several other women’s history organizations across the country, including the National Women’s History Project and the Chicago Area Women’s History Council. Furthermore, she has conducted research for museum and heritage centers such as the San Francisco Museum and Historical Society and the Museum of London, the latter of which included teaching classes on topics in archaeology, ranging from excavation to identifying different types of historic pottery. 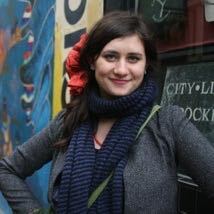 While studying for her masters in London, Hilary also worked on an oral history project that documented the stories of participants in Hyde Park’s historic Speaker’s Corner. Her research for the project contributed to the resulting audiovisual exhibit at the Bishopsgate Institute. In addition to her involvement with museums and historical societies, she has also worked in several capacities to further promote the experiences of women within a modern framework. She was an active Student Senator in her undergraduate college’s Coalition of Women Students, helping to plan events like the Women of Color Symposium and the Women of the Year Awards. She’s also been a contributor to the Literary Detectives, an online media center which studies the different representations of women in classical literature. Hilary received her MA in Archaeology from the University of London, Birkbeck, and her BA in Anthropology (minors in Women’s Studies and Classics) from DePaul University, graduating with honors. Her MA dissertation analyzed the relationship between ancient and modern gender roles in museum display. Hilary currently resides in Alexandria, Virginia.